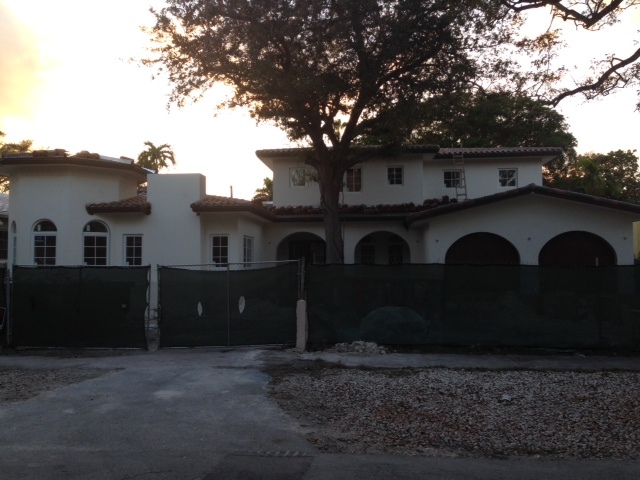 Currently under construction in Coral Gables is 2500 N. Greenway Drive. Located within walking distance to both the Granada golf course and the Biltmore golf course, this home is centrally located in Coral Gables on a very quiet, sought after street in the city. We had a chance to walk through the home which is about 80% completed and discussed the plans of what is going to be added. Lots of thought and detail has been put into the new construction of this home, including everything from the layout of the bedrooms down to the material of the kitchen counters, sparing no expense. The home is set to be a 5 bedroom, 6 1/2 bathroom, with an additional den. There will be a two car garage, pool, and spa, with room to spare on its large 16,625 square foot lot. Each room has its own bathroom and a significant amount of closet space. The front exterior will offer a large oak tree and circular driveway leading up to the two story home. On the first story, an elegant Venetian Pearl marble has been chosen for the flooring. This is found throughout the foyer, living room, kitchen, dining area, and the 2 bedrooms on the first floor. The kitchen will include an island and white wooden cabinetry. In addition, Wolf and KitchenAid appliances have been selected along with lovely white marble for the kitchen counters. Another room we are very excited to see is the den. This large room is equipped with a gas fireplace, will have hardwood floors, and a cypress wood-lined tower. The wooden staircase leads to the additional three bedrooms of the home. The entire upstairs is planned to have dark hardwood flooring in each of the rooms. The large master bedroom is bright because of its many windows, including the french doors leading to the balcony overlooking the backyard of the home. The covered balcony is set to have keystone flooring and a cypress wood ceiling. The master bathroom has an elevated roman tub and the shower is equipped with four jets. There will be a his & her closets, with something special in mind for “her” closet. We can’t wait to see what ideas they have in store! The house is set to be completed by April or May and will be listed at $2,890,000. It will truly be a gem in Coral Gables, with its excellent location and fantastic details, this is definitely not one to miss! For more information on this home or any other listed on this site, please feel free to contact Oscar Arellano or simply click here for our contact page. this website needs far more attention. I’ll probably be returning to read through more, thanks for the info!